This semester, the University of Rhode Island will be hosting their first ever eight-hour dance marathon to benefit the Children’s Miracle Network. With all proceeds going to Hasbro Children’s Hospital in Providence, Rhode Island, “RhodyThon” will last from 6 p.m. on Friday, March 24 to 2 a.m. on Saturday, March 25 in Mackal Field House. 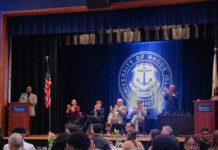 Popular at many institutions, the idea for URI to hold a dance marathon of their own was initially proposed by Hailey Flavin, president of the PanHellenic Council and executive director of student affairs for RhodyThon. Transferring schools, Flavin was able to experience a dance marathon and ultimately bring the event to URI. Following a summer internship with Assistant Director of Student Affairs, Kathy Collins, the dream became more tangible and Flavin was able to utilize her connections within the Leadership Institute, as well as Greek Life, to bring the idea into fruition. In regards to connections with campus organizations and affiliations, Student Senate will be co-sponsoring the event as a part of a contingency grant to reduce electronic costs. Additionally, Dean of Students, Dr. Daniel Graney, will be assisting with the cost of hiring the URI Police Department to provide security. All of this ensuring that the donations raised go directly to the Children’s Miracle Network. Working alongside Flavin is a board of students encompassing many different departments, clubs and organizations. Jordan Broadbent, executive director of marketing and outreach for RhodyThon, has been at the forefront of planning and organizing since the conception of the idea. To prepare for the event, Broadbent spent the J-term period reaching out to student organizations and clubs to encourage participation, as well as contacting corporations and businesses within the community for potential donations. Student involvement has reached unprecedented heights in terms of donations. JT Oldham, president of the Inter-Fraternal Council, worked closely with Flavin and other organizers to ensure successful participation from all of the fraternities. “We’re letting them just develop their own goals, instead of penalizing we’re allowing them to own up to themselves,” Oldham said. The decision to allow individual organizations to set their own fundraising goals and keep themselves accountable has been predominantly positive. “SAE’s national philanthropy is the Children’s Miracle Network,” Connor Meehan, sophomore and SAE legacy, said. Meehan has a personal connection through Boston’s Children Hospital where a team of doctors worked to repair a hole in his younger brother’s heart. “Since then, my family has participated in numerous fundraisers for the organization,” Meehan said. Although currently studying abroad, Meehan created a RhodyThon donation page and has been instrumental in his SAE brothers’ fundraising endeavors. RhodyThon registration will begin at 5 p.m. on March 23, with kickoff at 6 p.m. All are welcome and anyone may participate regardless of fundraising.